Some are sweet and some are savory, but all seven of these recipes are protein-packed and perfect for your healthy lifestyle! Pick one out and let's go make it! There's no such thing as having too many healthy recipes. Variation and experimentation keep food fun and your diet from growing intolerable. Even if you're a master of your "fit kitchen," these recipes will make an awesome addition to your collection. Pull up a chair and give these delicious recipes a look—and then a taste! I guarantee you'll find more than one that will make you stop everything and run to the nearest grocery store. If you have any questions, hit me up in the comments below. Eat well and hit your fitness goals! Delicious, quick, affordable, and healthy: those are the qualities I look for when I'm planning my diet. 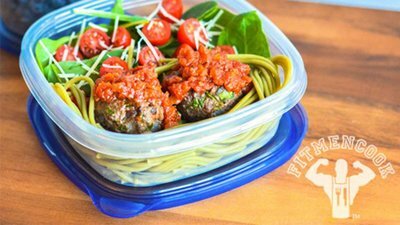 That's why I like incorporating meatballs into my weekly meal prep. Not only can I make them using different meats, but I can pack in a lot of delicious protein at a small cost with little hassle. Add your carb source and veggies, and you've got a certified muscle-building meal without breaking the bank. If you're looking for a way to spice up your routine chicken breast recipe, then give this recipe a try! I must warn you, though: You may never eat a regular chicken breast again! It's also highly likely that you'll spend the rest of your days trying to make each attempt of this recipe better than the last! Not only is salmon packed with protein, it's also full of healthy fats and nutrients. By all accounts, salmon is one of the best protein sources to add to your diet, but it can be difficult to cook and enjoy. It often takes trial and error to get your salmon recipe just right. I can save you time and heartache by sharing one of the easiest, tastiest recipes for salmon I know. You'll likely already have all of the ingredients in your refrigerator. Enjoy! So you've just demolished your workout and even hit a personal best on one of those stubborn lifts you've been stuck on. Now, you only have one thing on your mind: refuel! Instead of racing to the grocery store to stock up on Ben & Jerry's, reach for your case of Labrada ISO LeanPro and a Gold Bar. With them, you can create a muscle-building banana split that's so good even Mr. Olympia would shed tears of joy. A simple nutrition plan will ensure you go the distance and have a lifetime of good health. There's no need to use store-bought pancake mix full of flour and sugar. All you need is oatmeal and Lean Pro 8. The creamy taste of Lean Pro 8 vanilla sets these protein pancakes apart from all others you may have tried. Be careful not to sample the batter&mdash it may not make it to the skillet. And yes, I'm speaking from experience. It's that good! These are pretty epic, I must admit. Do you remember the old-school rocket pops you devoured as a kid? Well, these are better. Really! Not only do these popsicles taste amazing, but they are also packed with protein and BCAAs to help you build muscle and boost recovery. Enjoy these with a scoop of ISO Lean Pro Protein after your next workout.